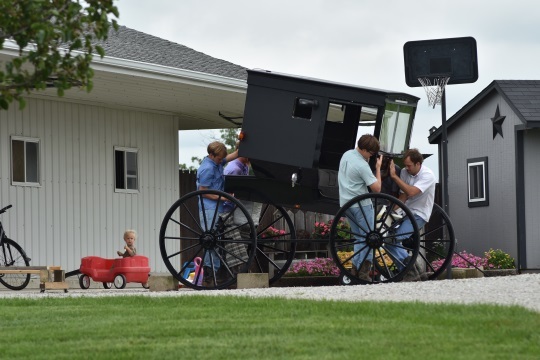 Reader Jim Halverson shares photos today from the northern Indiana Amish settlement. Taken on more than one occasion throughout the year, these are some nice shots showing buggy traffic and other activities going on in the settlement. I’ll let Jim take it from here to describe what we’re seeing in this visit to the world’s third largest Amish community. 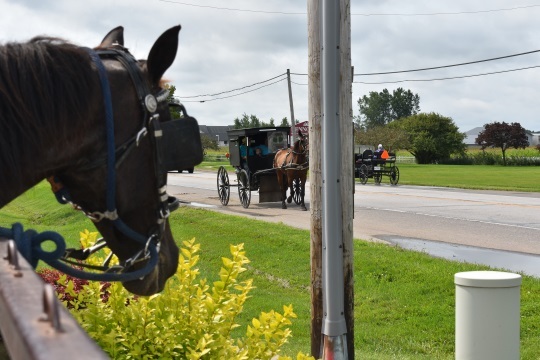 I have recently been making a few trips to Shipshewana, Indiana to explore a rekindled interest in Amish culture. 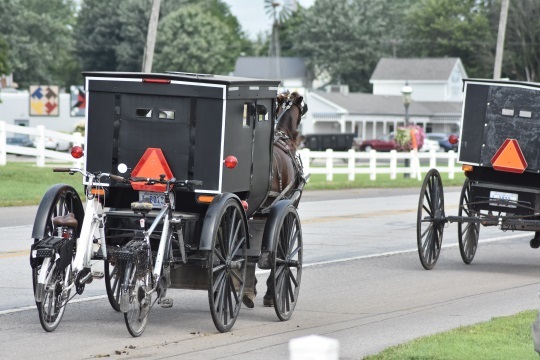 For those who may not be familiar with the area, Shipshewana is in LaGrange County which I believe is the third largest Amish community in the country. Shipshewana has always been noted for it’s large flea market and over the years a variety of shops have sprung up that cater to out of area visitors. There is also a popular theater and concert venue. After attending a concert there last April I decided to check out a consignment auction the next day that was a few miles from Shipshewana. I figured it might be an opportunity to get some photos of a few buggies. 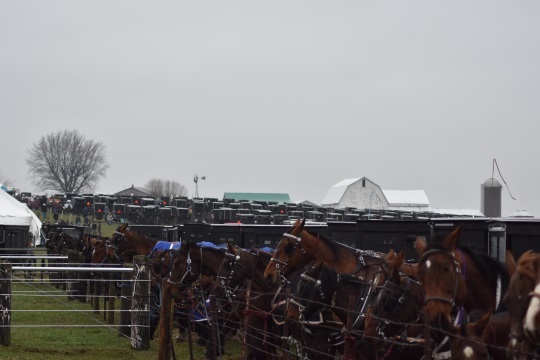 Not knowing anything about the auction plus the day being very cold with pouring down rain, I was expecting to see 30 or 40 buggies. When we arrived in the area we ran into “buggy jams” and I’m “guesstimating” there were over 600 buggies parked in 3 or 4 fields. 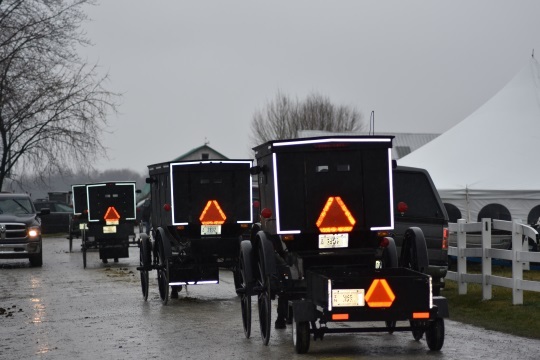 Sunday mornings are a good time to tour Amish Country. At several locations I saw homes where church services were being held. 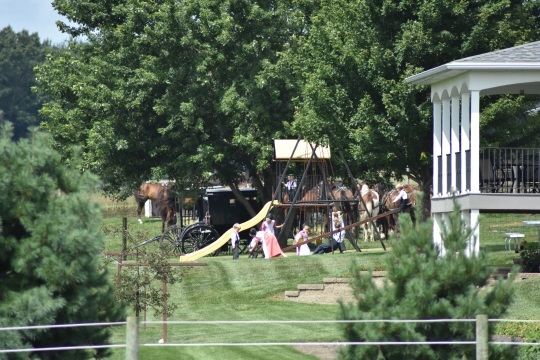 Below you see horses tethered between a tractor and a front end loader while church service was held near the home. Here are some kids playing outside a very nice home while church was going on. I noticed they were wearing their Sunday best. Driving in the area on Friday, August 24 I was reminded that school had already started and folks were finishing up some hay baling. 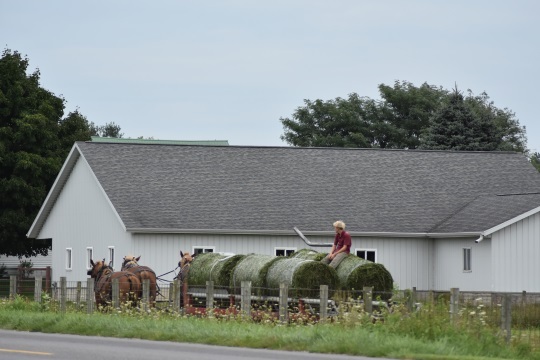 While it is difficult to see in the photo, to the right of the hay wagon is an arm that lifts the round bale onto the wagon. Saturday mornings are quite busy in Shipshewana. It appears that’s when folks are grocery shopping and coming into town for errands. While my wife was shopping at Yoder’s Red Barn Shoppes I sat near a hitching post and watched the bike and buggy traffic on State Road 5. 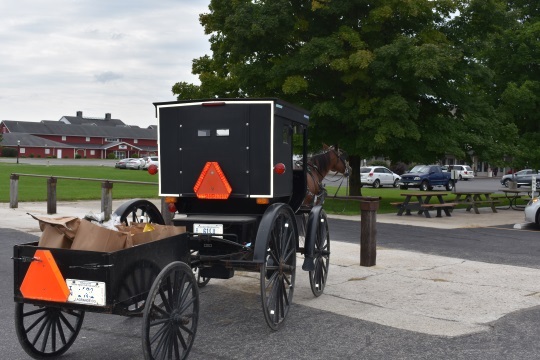 Here a buggy goes by the Menno-Hof Amish Mennonite Center. It looked like some folks were out having fun. I’m not sure if they are Amish, but the guys here were drafting behind a buggy that was flying down SR 5. The bike rack in this photo was quite interesting. I’ve seen similar set-ups for pickup trucks but not buggies. Things really slow down after noon on Saturdays so I took a drive in the countryside and saw some guys lifting what appeared to be a new buggy onto a carriage. 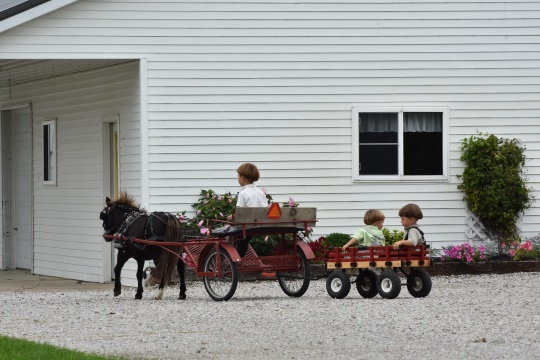 In the driveway of another home a young boy was giving even younger boys a ride in the pony wagon. Finally I came across a couple leaving a phone shanty and watched as they walked down the road towards home. There are several B&Bs, and half a dozen restaurants, but they aren’t owned by the Amish — that isn’t the kind of business an Amishman would own. But the restaurants, especially the Blue Gate in Shipshewana and Essenhaus in Middlebury, serve plenty of Amish-style food! That comment dates to 2014, but I checked and the business is listed in a couple of places online (basic business listing sites). Just to update this, I was in touch with the local reader again and he thinks this B and B is actually closed now. Not sure if there are any other Amish-owned lodging places in the area at this point. To me the people in the pictures don’t dress like the Amish we have in TN. The ones here dress in dark colors. The Amish we have do not want their picture taken. The ones in the pictures dress more like the Mennonites we have. Just an observation. 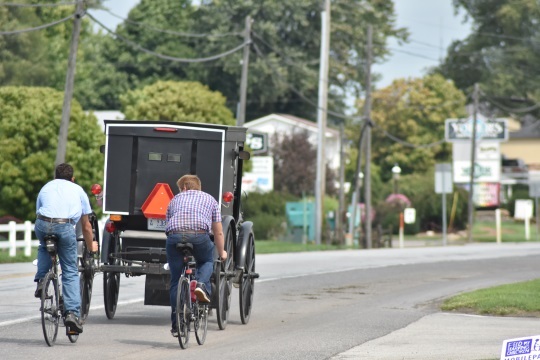 The Amish in the Napanese/Lagrange settlements dress much less plainly than even Mennonites in PA do, but are probably as conservative as Lancaster Amish. 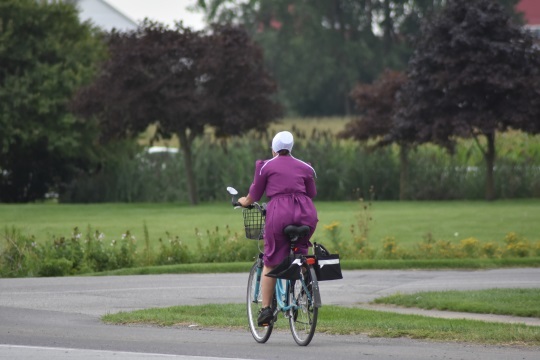 The Adams county Amish in Indiana dress more conservative. 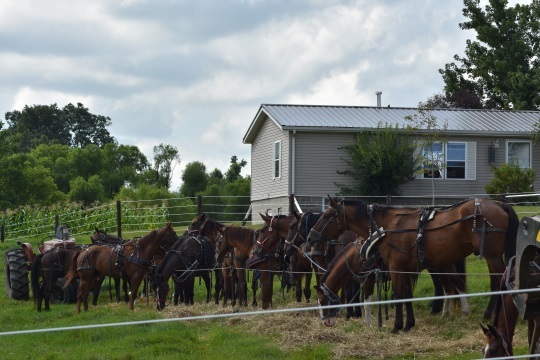 Cathy W., you have a lot of the Schwarzentruber Amish in Tennessee and they seem to prefer the darker colors. 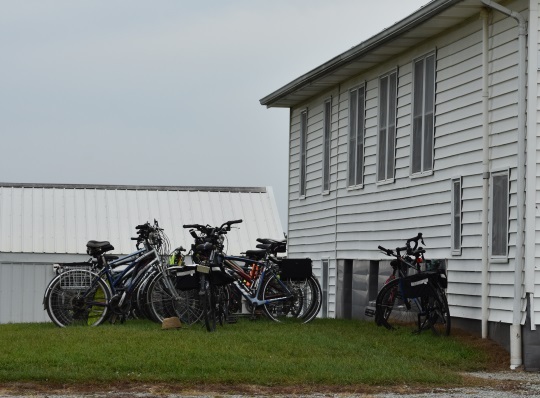 My husband and I participated in a Road Scholar program at the Mennonite Retreat Center in Sturgis, Michigan, in 2014. The focus of our excellent program was comparing Amish and Mennonite cultures. One of our many field trips was to the Menno-Hof Amish Mennonite Center in Shipshewana, Indiana. The displays and interactive exhibits as well as the movie shown were all excellently prepared and presented. We highly recommend the center to anyone traveling to Shipshewana. Thanks for publishing these photos. I always appreciate the effort of creating these informative pictures. Glad you like them Randy, Jim says he’s not a pro but I think he took some great shots. Thanks, Jim, for sharing these pictures and comments. I was at that “Yoder’s Consignment Sale” you shared pictures of. I, too, was surprised to see the huge crowd on such a rainy day. I entered the parking area in one field soon after the sale began, and there were already several cars which had gotten stuck in the mud, so I turned around and parked at an Amish school nearby. I have spent several weeks in this Elkhart/Lagrange settlement the past three years and learn more about the settlement every time I’m there. One thing I’ve learned is that the plainness in dress and use of technology varies between districts in the settlement. It seems like the least plain in clothing and the most use of technology is among the districts in and near to Shipshewana. As you travel farther east in the settlement, towards Lagrange, dress is plainer and use of technology is less. I’ve been told there is also at least one district northwest of Shipshewana in the Middlebury area that is less plain. The settlement has really expanded in geographical area and is still growing. There are Amish living as far west as Bristol and as far south as Cromwell. What you said about Shipshewana on Saturdays is also what I’ve found — very busy, but it really winds down starting around noon. Then on Sundays it’s almost like a different town — with very few cars and few buggies traveling through, and the vast majority of the stores,shops, restaurants, etc. are closed. I enojoyed your including a picture of Menno-Hof. 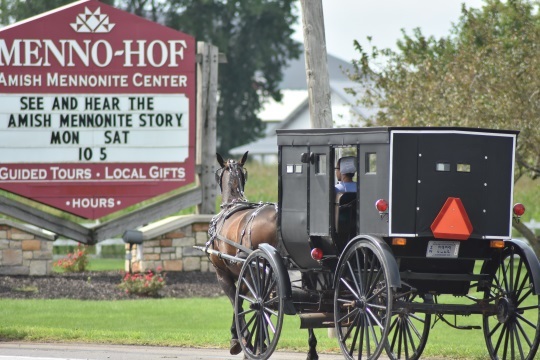 Menno-Hof will be celebrating its 30th Anniversary this Sunday, at Sept. 9, at 5 p.m. with a acapella hymn-sing in the Old Order Amish/Beachy Amish/Mennonite traditions and everyone is welcome. Cake and ice cream will be served after the Hymnsing. Sometime this year Menno-Hof hopes to have its one millionth visitor since it opened in 1988. Thanks for this additional update Al. It has been about 5 years since I last visited this settlement but spent a whole summer there in 2006. Seems it has stretched out a decent bit west and south. One of my favorite Amish areas. Correction — I meant to say that I’ve been told there is at least one district northwest of Shipshewana in the Middlebury area that is more plain. Al I think you’re referring to the area known as Barrens (I believe the district is known as Middle Barrens, not sure if there is more than the one). I have been through that area and visited homes there, it is a plainer area. A friend who lives in the area shared that someone in his family even saw signs of ice box refrigeration in this district (this would have been 5 years ago). Thanks for the pictures of some familiar sights! I grew up a few miles west of Shipshewana and graduated from the local public school, but I haven’t been back in years. 20+ years ago the Westview school district (Shipshewana, Scott, Topeka, and Emma) was half Amish through 8th grade. I had many good friends who were Amish. Sometimes students in the more progressive districts (or maybe just the one right around Shipshe) are allowed by their parents/ministers to go through high school. A few Amish boys in the 90s were starters on the high school basketball team. One boy a grade ahead of me played basketball, graduated from high school, got a degree from Goshen College, and then joined the Amish church. So there’s an Amish accountant in Shipshewana with an accounting degree. I think that’s pretty unusual. I had two close Amish friends as a teenager. One chose to join the Amish church and one chose to leave. We had many conversations about their choices and their desires in life. Quite an interesting way to think seriously about adulthood and potential lifelong commitments. During high school I worked for a local Amish construction crew as a driver/laborer during the summer and their driver during the school year. I have great memories of early morning and late afternoon conversations while picking them up and dropping them off. The men I worked with were willing to discuss any topic that came up. 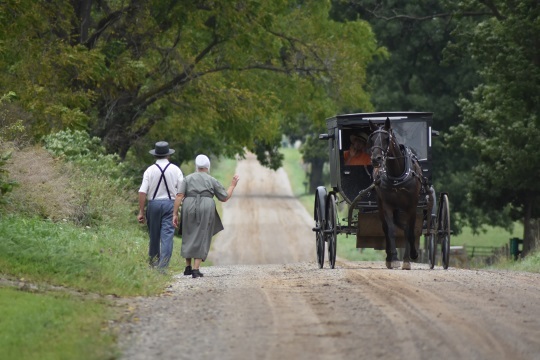 I miss having regular and familiar interactions with Amish friends and neighbors. Thanks for the trip down memory lane!